It really is quite difficult not to take notice of these beauties as you wander the streets and communities of Sonoma County in these remaining sunshine-filled summer days. The addition of Lagerstroemia to official street tree lists has added an exponential number of specimens to enjoy; and the blooms continue to multiply as we move from August into September. The deciduous Lagerstroemia indica and Lagerstroemia fauriei are both native to Asia. Significant hybridization between the two species has allowed the crape myrtle to have an expanded range with increased cold hardiness and a minimum of problems (powdery mildew is a challenge in other locations with increased humidity). These trees or large shrubs thrive in a variety of soils and environs, from a small bed surrounded by pavement at your local strip mall to the nurture of your home garden. In the 1700s, English plant collectors brought specimens back home with the hope of pleasing royal tastes for beautiful gardens; a failure as none of the trees ever bloomed! Subsequently, the trees were shipped to the much warmer American southern colonies. Crape myrtles have been a mainstay in traditional American southern landscaping ever since their introduction to Charleston, SC in 1786. Their addition to the Mediterranean zones here in California has also been quite successful. As it turns out, Lagerstroemia is really quite drought tolerant once established; too much summer water and fertilizer appears to decrease bloom intensity, and increases susceptibility to extreme cold. The most important quality needed for successful crape myrtles is the presence of heat, and then more heat if you can find it! A crape myrtle is the perfect selection for that ‘hot spot’ in your landscape, such as the sunny south side of your house where you can’t walk on the sidewalk without burning your feet. A cool summer will yield many fewer blooms; that first cold snap of the fall can stop the flowering cycle quickly. Here in Sonoma County you will not find peak blooms until somewhere around September 1. In addition to the beautiful blooms, the foliage of most varietals have a vibrant orange-to-red range of fall color, and the mottled trunk and peeling bark is one of the genus’s most endearing attributes, as it provides winter and early spring interest when the branches are bare. Each year a thin layer of bark forms and then peels; the resulting wood is a camouflage pattern of cinnamon brown, grey, cream, white, orange, and occasionally, a pale pink. Some varieties have much more decorative bark than others. Lagerstroemia really can be described as either a shrub or a tree; this is dependent on pruning and shaping during the life of the plant. A full size Lagerstroemia may reach 25-30’, though many varieties are smaller at maturity; a ‘Petite Series’ of dwarf versions is also available. Blooms are borne on new wood, so any pruning should be done at the end of winter or very early in the spring. If allowed to grow naturally from a small sapling, the crape myrtle will become a dense shrub, wider at the top but with branching and foliage all the way to the ground. My idea of a perfect pruning job on a Lagerstroemia allows for three to five main trunks arising from the base. After establishing those leaders in early years, begin pruning up the base of each trunk, allowing the beautiful bark and the architectural quality of the branching to shine. The multiple trunked Lagerstroemia also tend to have a much fuller canopy, and an increased bloom capacity. More often than not, crape myrtles are pruned to a single trunk (termed a ‘standard’); those street trees appear as oversized lollipops to my eye. Single-trunked specimens can be found in local nurseries with a Std. notation. Color choices range from white to pink to purple and most every shade in between. There are literally dozens of hybrids available: ‘Natchez’ is a traditional white with lovely bark, ‘Catawba’ blooms a violet purple, ‘Zuni’ is a vibrant lavender. I have two small L. Dynamite in my drought tolerant landscape at home. This varietal has leaves that vary green to red during the summer, and blooms a blood red. 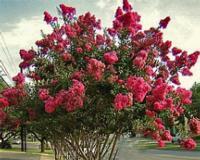 If I could just get them to grow faster …..
Crape myrtle culture is relatively easy if your pick your site properly. While the literature mentions scales and aphids as sometime pests, I have never seen evidence of either insect on my plants, and I have a large collection here in my garden in Petaluma. Crape myrtles are susceptible to powdery mildew, but, by selecting a resistant variety, you avoid this problem almost entirely. Give your plant enough water in the first year or so, and prune to maximize bloom and enhance shape. Since crape myrtles bloom on the current season’s wood, you want to prune them early in the growing season – usually February or March. (You can prune them in late fall, as they are dormant in winter, however if there is an unseasonal hot spell in late winter, the plants may leaf out. This new growth is then subject to frost damage.) Prune judiciously for shape – excessive pruning can cause overproduction of branches and the plant winds up looking like a thicket, with all of that beautiful bark hidden. You do want to remove all of the ‘suckers’ (the leafy growth from the base of the plant) and any internal, crossing branches. Otherwise, you can just prune out a few of the lower branches to highlight the bark on the remaining trunks, and shorten any extremely long branches. Take care not to cut them down below the existing branch intersections. If you prune carefully the first few years your plant will need little pruning thereafter. The best rule of thumb for pruning crape myrtles is that if you err to one extreme, pruning less is almost always better than pruning too much. Selecting the right variety for your site will minimize your pruning responsibilities – varieties are available from approximately 18” all the way up to tree size. Here is the full article on species Lagerstoemia by Sara Malone from which the above is excerpted.